Robbie Benson reels away in celebration at the Carlisle Grounds. AN IMPRESSIVE, IF routine display at the Carlisle Grounds saw Dundalk return to the summit of the Premier Division for at least 24 hours with a 3-1 victory over Bray Wanderers. The Lilywhites eased past the First Division-bound Seagulls despite gifting them a goal as they ran out 1-3 winners. Pat Hoban and Robbie Benson set the visitors on their way to victory in the first half before a Chris Shields blunder saw Jake Kelly pull one back. 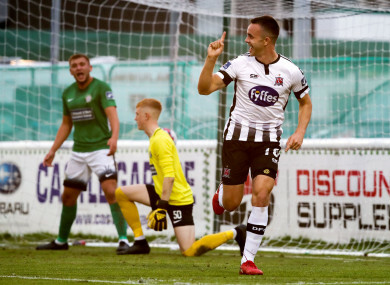 Dylan Connolly returned to haunt his former club though and ensure that Dundalk would once again take pole position in the title chase, leapfrogging Cork City until the champions’ meeting with St Pat’s on Sunday. There was a last-minute debut for 17-year old goalkeeper Enda Mingoue following the late withdrawal of Evan Moran and his clean sheet lasted 17 minutes. Jamie McGrath sent in a deep, hanging cross from the right and Hoban leapt highest to send a looping header over Minogue and into the far corner and bag his 23rd goal of the campaign. On 26 minutes, the Lilywhites doubled their lead as Robbie Benson floated a corner to the penalty spot. Brian Gartland met it powerfully and Robbie Benson applied the finishing touch from close-range. Another delivery from McGrath – this time a deep free kick – caused worry for the Bray defence as Daniel Cleary muscled his way to the ball but his header sailed over the crossbar. At the interval, it looked like the second half would be a procession for Stephen Kenny’s side but Chris Shields’ poor back-pass on 48 minutes changed that as it allowed Jake Kelly to steer past Rogers and halve the deficit. But ex-Seagull Dylan Connolly – introduced at the break – would restore the two-goal cushion and secure the three points with 15 minutes left on the clock. There were large suspicions of offside as Hoban was found but he brilliantly rolled Conor Kenna before putting it on a plate for Connolly at the back post. BRAY WANDERERS: Enda Minogue; Sean Harding (Cian Walsh, H/T), Conor Kenna, Sean Heaney, Kevin Lynch; Rhys Gorman, Paul O’Conor; Dragos Mamaliga (Darragh Noone, 72), Byron O’Gorman (Jake Ellis, 81), Jake Kelly; Ger Pender. DUNDALK: Gary Rogers; Sean Gannon, Brian Gartland, Daniel Cleary, Dane Massey; Chris Shields, Robbie Benson; Jamie McGrath (Dylan Connolly, H/T), Patrick McEleney (Ronan Murray, 61), Michael Duffy; Patrick Hoban (George Kelly, 85). Email “Dundalk return to Premier Division summit as Lilywhites stroll to victory on the seaside”. Feedback on “Dundalk return to Premier Division summit as Lilywhites stroll to victory on the seaside”.